Large numbers of barrel bombs have reportedly been dropped on the area in the Qalamoun mountains north-west of Damascus, close to the Lebanese border. 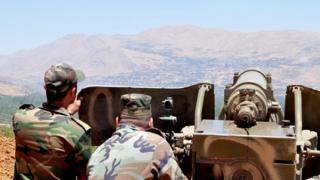 Zabadani has been under attack for weeks by the Syrian army and fighters from Lebanon's Hezbollah movement. It is the last significant town held by rebel forces in the Qalamoun region. Its capture is seen as crucial to consolidating the government's control over the border zone between Lebanon and Syria. The army and Hezbollah launched an offensive to drive the rebels out of Zabadani on 3 July. Earlier this week, they advanced deeper into the town after having besieged it from all sides. Citing local sources, Mr de Mistura said in a statement late on Tuesday that the Syrian air force had been dropping barrel bombs - large cylindrical containers filled with explosives and shrapnel - on areas in and around Zabadani. It has caused "unprecedented levels of destruction and many deaths among the civilian population," he was quoted by Reuters as saying. An alliance of Islamist and jihadist rebel groups had retaliated by firing rockets and heavy mortar shells on the villages of al-Foua and Kefraya, near the northern city of Idlib, where a large number of civilians were trapped, Mr de Mistura added. "In both cases, civilians are tragically caught in the middle of the fighting." Overnight, there were fierce clashes and air strikes in the Zabadani area, causing casualties on both sides, the UK-based Syrian Observatory for Human Rights said on Wednesday morning. The Syrian state news agency, Sana, meanwhile reported that soldiers had destroyed a 70m (330ft) tunnel used by rebel fighters to smuggle supplies from Zabadani to nearby Madaya. More than 230,000 people have been killed since the uprising against President Bashar al-Assad began in March 2011. Four million others have fled abroad to escape the fighting and more than seven million have been displaced internally. Earlier this month, the head of the UN's refugee agency, Antonio Guterres, called it the "worst humanitarian crisis of our generation".